I think most kids are fascinated by fire engines. Fire engines are these big mysterious vehicles they see racing to and from emergencies. In Fire Engine is Flashing, children will get to see what a day in the life of a firefighter is like. We met Fox on his way to work. Fox is a firefighter! We watch Fox and his crew answer an emergency call. The whole team gets to work trying to put out the fire. But when the fire chief arrives he notices someone stuck inside the building that is on fire. So Fox gets his special gear on and starts to climb the ladder. As Fox is climbing the ladder the crew start to expand the ladder so it can reach the window. But the fire engine is not close enough. So the fire engine slowly backs up and tries to position itself closer to the window. Now Fox can reach the person stuck inside. Fox carefully breaks the class and helps the lady out of the burning building and onto the ladder. By the time Fox and the lady reach the street everyone is cheering. They are so happy that Fox was able to rescue her and that everyone is safe. Once the fire is out, Fox and the crew head back to the fire station. At the end of the story, they have devoted two pages for a huge drawing of a fire engine. They have labeled all the parts of the vehicle. This makes for great conversations! Get your little one and ask them to name the parts of the fire engine. Or ask them which part is their favorite. Or even go over each part. This can be used as an educational book too. 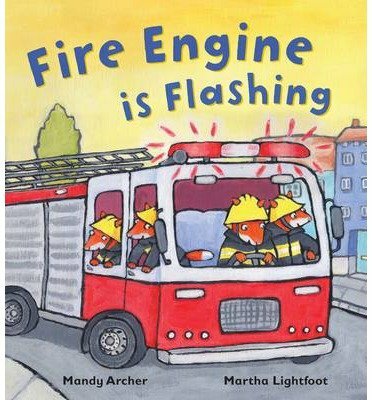 Fire Engine is Flashing is available online or at your local book retailer.